LONDON, Jun. 20 /CSRwire/ - A new report from Chatham House examining innovations in low-carbon cement and concrete details the policies, industry practices and investor support needed to advance technologies that reduce carbon emissions associated with cement, thereby facilitating compliance with the Paris Agreement on climate change. 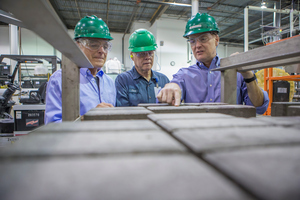 The report, Making Concrete Change: Innovation in Low-carbon Cement and Concrete was generated after a nine-month patent-landscaping exercise exploring novel cements and alternative clinker. Patent landscaping involves creating databases of patents for individual sectors or ‘technology areas.’ It is used to measure innovation, as well as to understand systems of innovation. Currently, patents for clinker reduction outnumber the patents for novel cement. Yet the report found that smaller companies with attractive and innovative patent portfolios have gained both financial and technical support from industry leaders. As a low-carbon option, Solidia Technologies® was showcased in the report as a viable solution with big potential impact and an extensive IP portfolio. To address the cement industry’s goal of reducing its carbon footprint, Solidia’s patented technology starts with an energy- and CO2-saving cement. It then uses this cement to produce a concrete that cures by a reaction with CO2 instead of with water. These capabilities combine to reduce the carbon footprint of cement and concrete by up to 70%. It also offers the ability to recycle up to 80% of the water used in concrete production. Using the same raw materials, mixing equipment, and forming processes as traditional concrete, the resulting CO2-cured concrete is more durable than traditional concrete, costs less to produce, and cures in less than 24 hours. “As our systems add value and reduce costs for both cement and concrete manufacturers, they require neither carbon taxes, nor penalties, nor public subsidies to facilitate adoption,” explained Dr. DeCristofaro. Currently in commercialization for large- and small-scale applications, the initial technology focus was on unreinforced precast applications, including pavers and blocks. Solidia is now developing commercial processes for reinforced applications, including aerated concrete, railroad ties, architectural panels and hollow core extrusions. Solidia Technologies® is a cement and concrete technology company that makes it easy and profitable to use CO2 to create superior and sustainable building materials. Based in Piscataway, N.J. (USA), Solidia’s investors include Kleiner Perkins Caufield & Byers, Bright Capital, BASF, BP, LafargeHolcim, Total Energy Ventures, Oil and Gas Climate Initiative (OGCI) Climate Investments, Air Liquide, Bill Joy and other private investors. Follow Solidia Technologies at www.solidiatech.com and on LinkedIn, YouTube and Twitter: @SolidiaCO2. Chatham House, the Royal Institute of International Affairs, is an independent policy institute based in London. Our mission is to help build a sustainably secure, prosperous and just world. We engage governments, the private sector, civil society and our members in open debate and private discussions about the most significant developments in international affairs. Each year, the institute runs more than 300 private and public events – conferences, workshops and roundtables – in London and internationally with partners. Our convening power attracts world leaders and the best analysts in their respective fields from across the globe. Our research work focuses on independent and rigorous analysis of critical global, regional and country-specific challenges and opportunities.